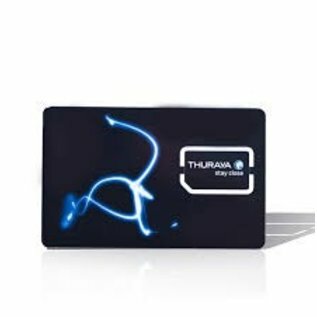 Thuraya prepaid voucher with different possible credits. The units on this prepaid voucher will be charged on your Thuraya SIM-card. Choose between 20 - 50 - 160 - 500 units. Thuraya prepaid voucher with different possible credits. The units on this prepaid voucher will be charged on your Thuraya SIM-card. The validity of your Thuraya Prepaid Voucher is unlimited. However, Thuraya wil automatically deduct 39 units of your credit every 12 months as a fee to validate your credit for another year. If there aren't enough units left on your Thuraya SIM-card, then Thuraya will block your SIM for outgoing calls. You will remain reachable for incoming calls for another 90 days, during which you need to buy a new Thuraya Prepaid Voucher of your choice. to top up your credits. After 90 days your Thuraya SIM-card will be blocked, and you will need to contact us first to reactivate your SIM prior to topping up your credit with a new Thuraya Prepaid Voucher. The cool down period of 14 days, within which you can send back the purchased product, is explicitly NOT applicable on this Thuraya Prepaid Voucher, because we activate it immediately upon receipt of your payment. You can however apply for a 14-day-cool-down period yourself, if you send an e-mail to astron@astron.be with your order number and your request to schedule the activation at least 14 days later (or on a specific date).